It was business as usual for Egypt’s security forces last month, as Egyptians hoping to run in the Shura (Consultative) elections on June 11 began to present their candidacy papers. As soon as registration opened for the mid-term elections, to choose half of the members of the upper house of Egypt’s parliament, three leaders of the Ikhwan al-Muslimeen (Muslim Brotherhood) were reportedly arrested in Alexandria for being “in possession of leaflets aiming at inciting public opinion.” Scores of other Ikhwan activists were arrested in the following days on a variety of charges that included holding “secret organisational meetings.” For the Ikhwan, the arrests were just another episode in the group’s continued confrontation with the repressive apparatuses of the state. 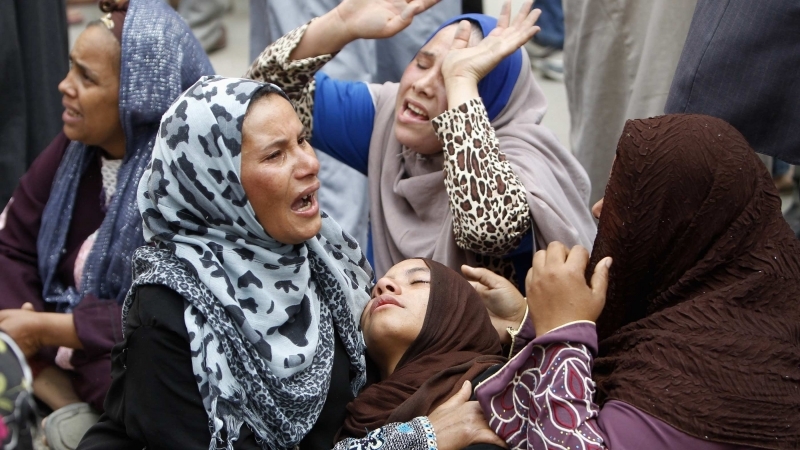 In the last few months, hundreds of Ikhwan members and supporters have been arrested in connection with their political activities. The arrests coincided with a court ruling on May 14 to uphold a decision by president Mubarak to try 40 members of the Ikhwan in a military court. Supreme Administrative Court judge ‘Issam Abd al-Aziz reversed a ruling in a lower court that declared the president’s decision invalid. An earlier court order for the release of this batch of detained Ikhwan members, who were arrested in December, had been issued in January, but was annulled a few days later by Mubarak, who ordered their trial before a military court instead. Several judges in civilian courts had also thrown out the charges against the defendants on the grounds of lack of evidence. The trial of the men, who are charged with money-laundering as well as financing and membership of a banned organisation, will resume on June 3. One of the defendants is the Ikhwan’s chief strategist and financier, Khayrat al-Shater, whose assets, together with those of other businessmen who have links to the movement, were frozen in February in an attempt by the government to cripple the Ikhwan financially. The government’s practice of trying civilians before military tribunals, which usually issue swift and harsh verdicts, has been condemned by human-rights activists both inside Egypt and abroad. An emergency law that has been in place since 1981 gives the president the authority to refer civilian detainees to military courts, prohibits gatherings of more than five individuals, and allows the prosecution of defendants on such ambiguous grounds as “besmirching the country’s image”. Last month, constitutional amendments were introduced that reinforce the president’s authority to try civilians in military courts. The use of arbitrary arrest to pre-determine election results is an established strategy in Egypt. In 1995 the government arrested scores of senior Ikhwan members before parliamentary elections and referred them to military courts, which meted out prison terms of up to five years for non-violent offences. 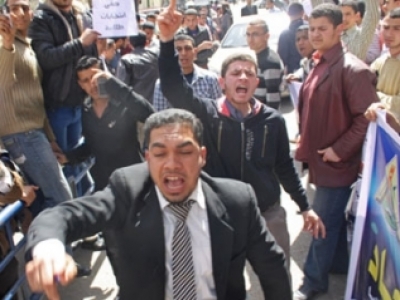 In 2005, thousands of Ikhwan members were arrested when the group put up its candidates as independents in an effort to evade the government’s ban on its political activity. On polling days, riot police deployed in constituencies where the Ikhwan had candidates sealed off polling stations, attacked voters with clubs, and sometimes even with live ammunition, in an attempt to limit access to polling stations. So far, some 400 Ikhwan leaders and activists have been arrested in the crackdown that began last December, after a military-like parade held by masked members of the group’s student branch on the campus of al-Azhar University. The parade brought about an avalanche of government accusations that the movement was forming a militia that provides youths with combat-training, knives and chains, with the ultimate aim of toppling the regime. The Ikhwan denies forming a militia. Even Ikhwan MPs were not immune from the ongoing wave of detentions: on April 29 Sabri Amer and Rajab Abu Zeid were arrested in the northern Nile Delta province of al-Mannoufiyyah; they were released the next day. The Ikhwan, which was established in 1928 by Hasan al-Banna, a Sufi schoolteacher in the city of Isma’iliyyah, advocates the re-establishment of the Islamic caliphate. Imam Banna was influenced by Muslim reformist thinkers such as Muhammad ‘Abduh and Rashid Rida, who tried to revitalise and restore Islamic civilisation. Despite its original commitment to non-violence, the group set up a secret paramilitary organisation in the 1940s known as al-Jihaz al-Khas (“special apparatus”), which was suspected of a wave of assassinations and bombings. The government responded in 1948 by banning the group. In 1949 Banna was assassinated, apparently in response to the killing of prime minister Mahmud Fahmi Nuqrashi by members of the Special Apparatus in December 1948. But the Ikhwan continued to operate as a semi-secret organisation until it was banned in 1954, when the government of Gamal Abd al-Nasser accused it of an assassination attempt on him while he was speaking in Alexandria. The Ikhwan denied involvement in the attempt on Nasser’s life and accused the government of staging the whole incident in order to use it as a pretext to crush the movement. One of the main lessons learnt by the Ikhwan during the Nasser’s repression, in which thousands of its members were systematically tortured and jailed, was to put the preservation of the group above risking an all-out confrontation with the government. This, in addition to the strict limitations in the Shari‘ah on the use of violence in Muslim society, articulated by traditional Sunni jurists, explains why the Ikhwan’s core has not taken part in political violence in Egypt for more than half a century. Forced to go underground during Nasser’s repression, the Ikhwan re-emerged on the political scene during the rule of Anwar al-Sadat, Nasser’s successor. In his drive to curb the influence of Egyptian Nasserites and leftists, Sadat began a rapprochement with the Ikhwan, releasing prisoners and promising to implement the Shari‘ah. This gave the Ikhwan an opportunity to operate within the system under the slogan “Islam is the solution” (al-Islam huwa al-hal). The group has since become Egypt’s strongest and most vibrant opposition movement; it now has now some 7,000 chapters around the country, complete with a network of mosques and charitable organisations, which operate educational institutions, provide medical services, and distribute various forms of aid to the poor. 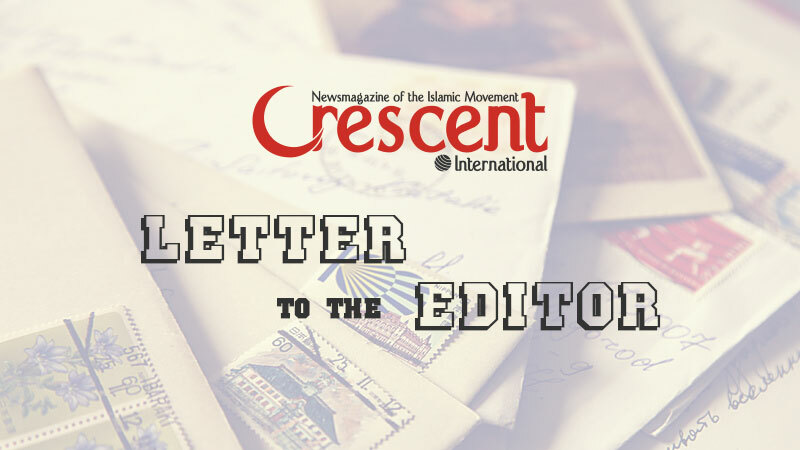 In the past few years, the Ikhwan has jumped on the democracy bandwagon, adopting a discourse which places the issue of ‘freedom’ at the top of the group’s agenda and taking steps to position the Ikhwan as a mainstream reform force. In its participation in civil society, the Ikhwan has been careful to conduct itself in a way that promotes an impression of being after pluralism rather than dominance. For instance, in recent elections for the boards of the lawyers’ and doctors’ syndicates, the Ikhwan fielded fewer candidates than it could have done, thus allowing more space for representation from both pro-government and secular opposition groups. Ikhwan representatives in the syndicates seem to be helping to reduce mismanagement and improve performances. The Ikhwan has also tried to cooperate with other opposition groups to coordinate strategy and organise street demonstrations and other activities. In the legislative elections last November and December, the Ikhwan ran only 130 candidates to enable other opposition parties to put up candidates. The Ikhwan’s disciplined presence in parliament has improved attendance at parliamentary sessions and meetings of legislative committees. Absenteeism, which was a chronic problem because of the disinclination of delegates of the ruling National Democratic Party (NDP) to attend late-night meetings, has declined since the Ikhwan got 20 percent of parliament’s 454 seats in the last elections. Because votes can be held regardless of the number of MPs in attendance at these sessions, the punctuality of the Ikhwan’s MPs in attending all sessions has forced the NDP MPs to attend to prevent the Ikhwan from steering parliamentary proceedings towards its own agenda. Nevertheless, the Ikhwan’s performance in parliament is hobbled by the fact that the NDP holds a two-thirds of the seats in the house – a majority vote that enables the NDP to pass any bills and constitutional changes it desires. Shorn of meaningful legislative weight, the Ikhwan’s bloc finds itself confined mainly to using the parliament as a forum for debate on government policies. It also showers parliamentary committees with requests for information that can embarrass the government, as it did in January, when it demanded a report on torture from the parliamentary defence committee and presented the ministry of the interior with a questionnaire on the status of 30,000 detainees. But the Ikhwan’s participation in the political process has provoked the ire of fringe extremist elements who believe in the futility of political participation. For instance, on January 6, al-Qa‘ida no. 2, Egyptian-born Ayman al-Zawahiri, issued a video message in which he criticised the Ikhwan for its participation in “the political game that America is playing in Egypt, through presidential and parliamentary elections, to exploit the masses and their love for Islam.” Disenchantment with the Ikhwan’s commitment to non-violence has often led to the formation of more radical groups by disgruntled breakaway members, as in the case of offshoot organisations such as the al-Jama‘ah al-Islamiyyah (“the Islamic group”) and al-Takfir wal-Hijrah (“excommunication and migration”). Participation in the political process has brought to the fore a web of complexities surrounding the Ikhwan’s status as a political party. The Brotherhood’s obsession with circumventing the government’s ban on religion-based political parties has fuelled internal debate on whether the group should adopt tactics similar to those of Turkey’s ruling Justice and Reform Party in order to be able to operate legally. Among the proposals currently under discussion is the establishment of a political party with a non-religious platform, while maintaining the Ikhwan as a religious organisation. There is an inescapable element of neutralisation in this process of soul-searching. One can only hope that it does not result in a radical change of mind or a drastic change of heart.